There is one more topic left for discussion on this Website. This topic is presented in the next three postings. They are QA: What is the Participatory Universe Hypothesis, QA: What is Base-9 Arithmetic (Spirit-Destiny of Numbers) and QA: What is Quantum–Metaphysics (Soul-Personality of Numbers). Five pages and 55 postings have been written on this Paradigm. Before starting on these next two postings, it is time for a review on what we have accomplished, if anything at all. 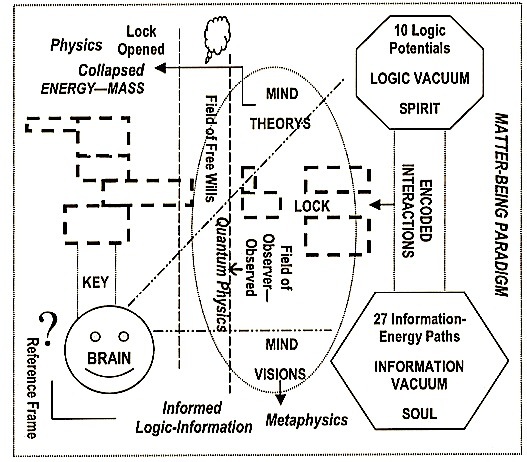 Four branches of studies and their interactions (which can be entangled within each branch, or in their interactions, inside the free will field) are depicted in the diagrams. None of these branches, taken one at a time or in any combination, have a complete descriptions of Reality. A limited (incomplete) discussion of each of these branches as described within the participation in one of the two worlds is stated below. No Understanding on the existence of Soul-Spirit; thus No Understanding of the Crossover process or the notions of a Vacuum / the Aether, Non-Locality, Entanglement, and so on. As stated earlier, an combination or any combination (with a Holon integration) of all four subjects can offer a complete description of reality. A complete description of reality can only be obtained by a Holon integration of the Matter-Being Paradigm. What’s presented in this Website is only the beginning of this Holon integration.